Blogger blogs usually come with at navbar at the top of the blog, which helps you to search for other blogs and has a button that gets you to blogger.com. While these can be useful for some reasons they don't always look that professional and may not match your individual blog design. Besides removing them you also have the option to choose another colour so you get the design and the usefulness. Both things can easily be done under the category "layout" which you find in the menu on your blogger dashboard. Look for the "navbar" box and click "edit", then either choose your favourite navbar or select "off" to remove it. #2 Remove "Powered by Blogger"
Another source of irritation on a clean design could be the "Powered by Blogger" writing at the bottom of each Blogger blog. The following tutorial gives you 3 methods how to remove it so at least one of them should work for you: click. These lines apparently are a feature of the "Simple Template" which I think a lot of us use. They appear at the bottom of a blog, where it says "home" "older posts" and "newer posts". In my eyes they are totally useless and yet quite disturbing so learn how to remove them here. Having good quality pictures on your blog is hard enough so we should avoid anything that makes them look unprofessional. Besides from a good size, they should also be without these white borders that make them withdraw from the background. Get the tutorial over here. Social media icons are something I really like as they look so cute and yet really clear and there are a million ways of doing your own so they will match your blog design for sure. I've only been having my social media icons (the pink link buttons to my social networks which you can see at the top of my sidebar) for a few weeks and as they are not that easy to make my boyfriend helped me out with them. Luckily for you today I found a really easy tutorial for which you don't need anything else than some icons (which you can find on the internet) and blogger.com. Find the tutorial video here. 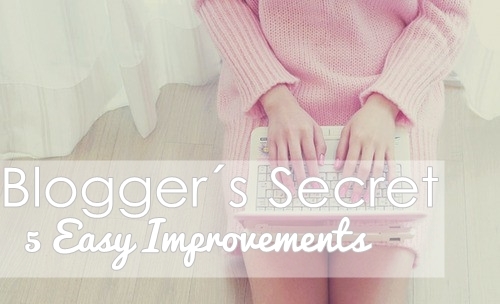 I really hope you liked these little blog improvements. If you decide to try all of them you should plan some time and patience and if one of the tutorials shouldn't work for your blog, you can still browse the internet for alternatives. Is there anything else you think should be removed on or added to a blog to give it a better design? Ohh I'm really in need of doing #4! I'm going to figure this out right now. Thank you! Ich werde dieses WE das mit den Social Media Buttons ausprobieren und Powered by Blogger entfernen! Deine Tipps sind echt Gold wert, find ich super. Haha oh yeah, already did all this! I definitely need to keep the navbar tip in mind. I didn't know you could delete it! Thank you for the tips! I think a must, is that blog pictures are in the same width, therefore the blog looks more polished and professional! This is such a great post!! Love! Sehr hilfreich! Werde es mal ausprobieren (: Toller Post! Thank you so much for these tips! I'm off to do n.4 immediately! Tipp Nr. 1 fand ich super, habe sooft an meinem Layout rumgebastelt und nie darüber nachgedacht wie störend die ist! Tolle Tipps, vielen vielen Dank! Deinen Header find ich superschön übrigens! Very good written and helpful post - thank you!